Coffee is looking good, even great in 2019. The annual Good Food Awards held its annual awards ceremony in San Francisco on January 11, 2019 celebrating achievements in American food culture across the categories of beer, charcuterie, cheese, chocolate, cider, confections coffee –a beverage we love the most- fish, honey, oils, pantry, pickles, preserves, spirits and two new additions: elixirs and snacks. Twenty-five companies were nominated in the coffee category from Oregon to Virginia and from Minnesota to Texas. Like last year, link to California leads the Good Food Awards win with three roasters; Bird Rock Coffee Roasters (Geisha XO) from San Diego California, Drink Coffee, Do Stuff (Ethiopia Guji Hambela Wamena) from Truckee California and Thanksgiving Coffee Company (Upsetter Espresso) from Fort Bragg California. This Coffeetograher is proud to be a Californian. And as well, a descendant of Texas heritage on my maternal grandmother’s side with Oak Cliff Coffee Roaster’s (Girma Eshetu) win. Then, the tally of wins moves North to Minnesota with two wins, continuing on to the Pacific Northwest to Oregon which also has two wins followed by the Midwest state of Minnesota with two wins. As the West, Pacific Northwest and Midwest give us the majority of multiple state wins, the individual wins coming out of the south, east and south east are of note as well. The official tally of winners include Arkansas (1), California (3), Colorado (1), Maine (1), Massachusetts (1), Minnesota (2), New Jersey (1), Oregon (2), Texas (1), Virginia (1), Washington (1). It looks like the culture is ready for a great American coffee road trip. 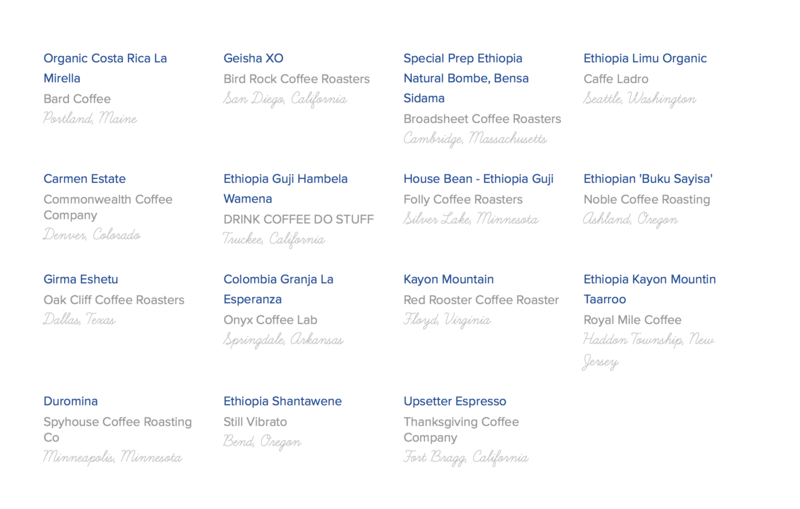 This entry was posted in coffee shops and tagged bard coffee, bird rock coffee roasters, broadsheet coffee roasters, coffee ladro, commonwealth coffee company, drink coffee do stuff, folly coffee roasters, good food awards, noble coffee roasting, oak cliff roasters, onyx coffee lab, red rooster coffee roaster, royal mile coffee, san francisco, spyhouse coffee roasting, still vibrato, thanksgiving coffee company. Bookmark the permalink.